The SircleLam QuickPrint 27 is a full featured, versatile 27″ heated roller roll laminator with mounting capability designed with superior technology to provide high quality, professional lamination results for every job. This machine is capable of thermal laminating, cold laminating, mounting and encapsulating a variety of materials including full color digital output, pre-treated adhesive boards, and foam mounting board. 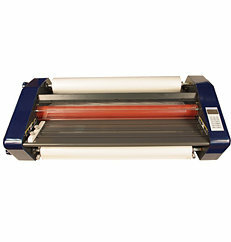 The QuickPrint 27 is one of the most versatile roll laminators on the market. The SircleLam QuickPrint is equipped with variable temperature and speed controls and accommodates film from 1.5 mil to 10 mil in thickness. With a quick warm-up time of 15 minutes, an easy-to-read LCD display, four temperature presets for each of the standard film thicknesses, and a slide away lower idle bar allows for a quick and easy laminating and film loading process. These features, combined with its 3/16″ mounting capability, make it a perfect laminating solution for schools, copy shops, large offices and print-on-demand businesses. The cooling fans and the automatic shut off prevents the laminator from overheating. With the safety shields and switch, a feed table with safety latch and guides and variable speed control it allows optimal safety for its users. The reverse function and built-in laminate trimmer which is included with every machine to ensure satisfaction with every use. If you have any questions or are interested in purchasing a SircleLam QuickPrint 27 , visit us at SpiralBinding.com. We have great pricing on a full line of Variable Speed Laminators. Call us at 1-800-631-3572 for more information.